What makes us stand out is a clear vision to offer a good value education. You just want to learn some useful Skills or find certificated Courses to develop your career? You want to meet people while learning or find a relevant Trainer who you can talk to about your needs or you simply like the Flexibility of online Courses? You have some money to invest or want to learn some free skills? At Trainingmatchmaker.com you can find all these types of learning opportunities. Free or paid online and Face-to-Face Courses, categorised by topics so that you easily and quickly find what you are interested in or a brand new topic to inspire your next learning journey. Trainingmatchmaker.com is a so called Aggregator Site. We collect Training Courses to give our visitors help to find learning opportunities. With many filters like location, time, price and many more we aspire to help you to find what you need. TrainingMatchmaker.com founder: Chartered Marketer Christine Watson has been a Licensed Trainer for the past 7 years. Delivering training to over 1,000 individual clients herself personally, Christine understands first hand the desire to have all seats on a training course filled and the juggling and time pressures of trying to develop your training business whilst at the same time delivering energetic training to delegates. Are you a trainer hosting courses on your own? 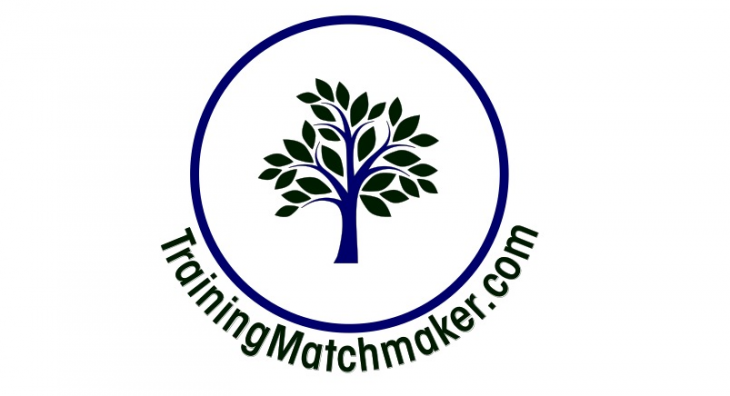 Trainingmatchmaker.com could be the right platform to help you as an Independent Trainer reach people out there – delegates to attend your training and potential new clients and business opportunities. With your own Trainer Profile you can publish your Trainer credentials alongside your courses at Trainingmatchmaker.com and give people the opportunity to find you and contact you with sales enquiries. TrainingMatchmaker.com’s mission is to inspire learning and to provide a community service to local Trainers who dedicate their time to training others. Connecting training professionals to allow them to be more productive and successful. Central to this mission is our commitment to be transparent about the data we collect about you, how it is used and with whom it is shared. TrainingMatchmaker.com will be the controller of your personal data provided to, or collected by or for, or processed in connection with our Services; you are entering into the User Agreement with us. You provide data to create an account with us as a Trainer, Organisation Needing a Trainer or Organisation/Trainer providing a Learning Opportunity. To create an account you need to provide data including your name, email address and/or mobile number. If you register for a premium Service, you will need to provide payment (e.g., credit card) and billing information. You create your profile (a complete profile helps you get the most from our Services). You have choices about the information on your profile, such as your education, work experience, skills, photo, location, endorsements and any other information you include in your submission form. Some Members may choose to complete a ‘paid for’ premium profile to enable additional benefits to be unlocked. You don’t have to provide additional information on your profile; however, profile information helps you to get more from our Services, including helping visitors and business opportunities find you. It’s your choice whether to include sensitive information on your profile and to make that sensitive information public. Please do not post or add personal data to your profile that you would not want to be publicly available. You give other data to us, such as by syncing your communications channels. We collect personal data from you when you provide, post or upload it to our Services, such as when you fill out a form, respond to a survey, or submit a resume/CV/Trainer Profile. You don’t have to post or upload personal data; though if you don’t, it may limit your ability to grow and engage with our visitors and potential business opportunities over our Services. You and others may post content that includes information about you (as part of articles, posts, comments, videos) on our Services. Unless you opt-out, we collect public information about you, such as professional-related news and accomplishments (e.g. professional recognition, conference speaking gigs, projects, etc.) and make it available as part of our Services (e.g. suggestions for your profile, or notifications of mentions in the news). We receive personal data (including contact information) about you when others import or sync their contacts or calendar with our Services, associate their contacts with Member profiles, or send messages using our Services (including invites or connection requests). We receive personal data about you when you use the services of our customers and partners, such as employers/organisations needing training, prospective employers/training clients, training venues and learners seeking learning opportunities. We receive data about you when you use some of the other services provided by us or our affiliates. For example, you may choose to send information about your clients and contacts to us for improved professional networking activities on our Services. We log usage data when you visit or otherwise use our Services, including our sites, app and platform technology (e.g., our off-site plugins), such as when you view or click on content (e.g., learning video) or ads (on or off our sites and apps), perform a search, install or update one of our mobile apps, share articles or apply for trainer opportunities, learning opportunities or other aspects of our service. We use log-ins, cookies, device information and internet protocol (“IP”) addresses to identify you and log your use. We collect information about you when you send, receive, or engage with messages in connection with our Services. For example, if you get a connection request, we track whether you have acted on it and will send you reminders. We also use automatic scanning technology on messages. When your employer/ client or school buys a premium Service for you to use, they give us data about you. Others buying our Services for your use, such as your employer/client or your school, provide us with personal data about you and your eligibility to use the Services that they purchase for use by their workers, students or alumni. For example, we will get contact information for Company Page administrators and for authorising users of our premium Services, such as our recruiting, sales or learning products. We get data when you visit sites that include our plugins, ads or cookies or log-in to others’ services with your TrainingMatchmaker.com account. We receive information about your visits and interaction with services provided by others when you log-in with TrainingMatchmaker.com or visit others’ services that include our plugins, ads, cookies or similar technologies. How we use your personal data will depend on which Services you use, how you use those Services and the choices you make in your settings. We use the data that we have about you to provide and personalise, including with the help of automated systems and inferences we make, our Services (including ads) so that they can be more relevant and useful to you and others. Our Services help you connect with others, find and be found for work and business opportunities, stay informed, find learning opportunities, get training, present to new clients needing to find a trainer, secure new clients, meet other trainers online and face to face and be more productive. We use your data to authorise access to our Services. Our Services allow you to stay in touch and up to date with colleagues, partners, clients, and other professional contacts through your profile information. To do so, you will complete and submit a form to TrainingMatchmaker.com. When you connect with others – you are connecting independently from TrainingMatchmaker.com eg via telephone number, email, social media or other information that you have provided on your data form. You will be able to search each others’ content (as per the choices you have submitted) in order to exchange professional opportunities. We will use data about you (such as your profile, profiles you have viewed or data provided through uploads or partner integrations) to help others find your profile, suggest connections for you and others (e.g. Members who share your contacts or job experiences) and enable you to invite others to become a Member and view your profile or learning opportunity and connect with you. You can also opt-in to allow us to use your precise location or proximity to others for certain tasks (e.g. to suggest other nearby Trainers / Learning Opportunities/ Organisations seeking a Trainer for you to connect with, calculate the commute to a new training opportunity, or notify your connections that you are at a professional event). It is your choice whether to invite someone to our Services. Our Services allow you to stay informed about news, events and ideas regarding professional topics you care about, and from professionals you respect. Our Services also allow you to improve your professional skills, or learn new ones. We use the data we have about you (e.g., data you provide, data we collect from your engagement with our Services and inferences we make from the data we have about you), to recommend relevant content and conversations on our Services, suggest skills you may have to add to your profile and skills that you might need to pursue your next opportunity. So, if you let us know that you are interested in a new skill (e.g., by clicking on a learning opportunity or watching a learning video), we will use this information to personalise content to you, suggest that you visit or follow certain members on our site, or watch or view related learning content to help you towards that new skill. We use your content, activity and other data, including your name and picture, to provide notices to your network and others. For example, subject to your settings , we may notify others that you have updated your profile, posted a blog, took a social action, made new connections or were mentioned in the news. Our Services allow you to explore training opportunities, evaluate educational opportunities, and seek out, and be found for professional opportunities. Your profile can be found by those looking to hire (for a job or a specific task) or be hired by you. We will use your data to recommend Trainers, training opportunities, jobs or mentees, show you and others who work at a company, in an industry, function or location or have certain skills and connections. You can signal that you are interested in new training opportnities and share information with recruiters/clients seeking to find a Trainer to match their training needs. We will use your data to recommend oportunities jobs to you and you to recruiters. We may use automated systems to profile and provide recommendations to help make our Services more relevant to our Members, Visitors and customers. Keeping your profile accurate and up-to-date may help you better connect to others and to opportunities through our Services. Our Services allow you to collaborate with colleagues, search for potential clients, customers, partners and others to do business with. Our Services allow you to communicate with other Members and schedule and prepare meetings with them. Our premium Services allow paying users to search for and contact Members through our Services, such as searching for and contacting relevant Trainers, Learning providers and Organisations seeking a Trainer as well as others such as Training Venues. Your choice as to how you are contacted by others is your responsibility when you complete your profile. You may receive sales leads, networking opportunities and are provided the opportunity promote content through social media. We sell premium Services that provide our customers and subscribers customised-search functionality and tools (including messaging and activity alerts) as part of our talent, marketing and sales solutions. Customers can export limited information from your profile, such as name, headline, current company, current title, and general location (e.g., Dublin), in order to manage sales leads or talent, unless you opt out. We do not provide contact information to customers as part of these premium Services without your consent. A premium Services customer can store information he/she has about you in our premium Services, such as a resume or contact information or sales history. The data provided about you by these customers is subject to the policies of those customers. We will contact you through email, mobile phone, notices posted on our websites or apps, messages to your inbox, and other ways through our Services, including text messages and push notifications. We will send you messages about the availability of our Services, security, or other service-related issues. We also send messages about how to use the Services, network updates, reminders, job suggestions and promotional messages from us and our partners. You may change your communication preferences at any time. Please be aware that you cannot opt-out of receiving service messages from us, including security and legal notices. We serve you tailored ads both on and off our Services. We offer you choices regarding personalised ads, but you cannot opt-out of seeing other ads. We will show you ads called sponsored content which look similar to non-sponsored content, except that they are labeled “ads” or “sponsored.” If you take an action (such as like, comment or share) on these ads, your action is associated with your name and viewable by others, including the advertiser. Subject to your settings, if you take a social action on the LinkedIn Services, that action may be mentioned with related ads. We adhere to self-regulatory principles for interest-based advertising and participate in industry opt-outs from such ads. This does not opt you out of receiving advertising; you will continue to get other ads by advertisers not listed with these self regulatory tools. You can also opt-out specifically from our uses of certain categories of data to show you more relevant ads. We use data, including public feedback, to conduct research and development for the further development of our Services in order to provide you and others with a better, more intuitive and personalised experience, drive membership growth and engagement on our Services, and help connect professionals to each other and to economic opportunity. We seek to create economic opportunity for Members of the global workforce and to help them be more productive and successful. We use the personal data available to us to research social, economic and workplace trends such as learning opportunities and ‘I need a Trainer’ provision, availability, requests and skills needed for these opportunities and policies that help bridge the gap in various industries and geographic areas. In some cases, we work with trusted third parties to perform this research, under controls that are designed to protect your privacy. We publish or allow others to publish economic insights, presented as aggregated data rather than personal data. We use your data to produce and share aggregated insights that do not identify you.. For example we may use your data to generate statistics about our members, their profession or industry, to calculate ad impressions served or clicked on, or to publish visitor demographics for a Service or demographic workforce insights. Some Members (or their employers) need, for legal or professional compliance, to archive their communications and social media activity, and will use services of others to provide these archival services. We enable archiving of messages by those Members outside of our Services. For example, a financial advisor needs to archive communications with her clients through our Services in order to maintain her professional financial advisor license. Subject to your settings, other services may look-up your profile. When you opt to link your account with other services, personal data will become available to them. The sharing and use of that personal data will be described in, or linked to, a consent screen when you opt to link the accounts. For example, you may link your Twitter or WeChat account to share content from our Services into these other services, or your email provider may give you the option to upload your profile into its own service. You may revoke the link with such accounts. Subject to your settings, excerpts from your profile, will appear on the services of others (e.g., search engine results, mail and calendar applications that show a user a “mini” TrainingMatchmaker.com profile of the person they are meeting or messaging, social media aggregators, talent and lead managers). “Old” profile information remains on these services until they update their data cache with changes you made to your profile. We share your data across our different Services and TrainingMatchmaker.com-affiliated entities. It is possible that we will need to disclose information about you when required by law, subpoena, or other legal process or if we have a good faith belief that disclosure is reasonably necessary to (1) investigate, prevent, or take action regarding suspected or actual illegal activities or to assist government enforcement agencies; (2) enforce our agreements with you, (3) investigate and defend ourselves against any third-party claims or allegations, (4) protect the security or integrity of our Service (such as by sharing with companies facing similar threats); or (5) exercise or protect the rights and safety of TrainingMatchmaker.com, our Members, personnel, or others. We attempt to notify Members about legal demands for their personal data when appropriate in our judgment, unless prohibited by law or court order or when the request is an emergency. We may dispute such demands when we believe, in our discretion, that the requests are overbroad, vague or lack proper authority, but we do not promise to challenge every demand. We retain your personal data while your account is in existence or as needed to provide you Services. This includes data you or others provided to us and data generated or inferred from your use of our Services. Even if you only use our Services when looking for a new opportunity every few years, we will retain your information and keep your profile open until you decide to close your account. In some cases we choose to retain certain information in a depersonalised or aggregated form. We provide many choices about the collection, use and sharing of your data, from deleting or correcting data you include in your profile and controlling the visibility to advertising opt-outs and communication controls. We offer you settings to control and manage the personal data we have about you. Visitors can learn more about how to make these requests by contacting us and we will consider your request in accordance with applicable laws. Residents in some Countries may have additional rights under their laws. If you choose to close your TrainingMatchmaker.com account, your personal data will generally stop being visible to others on our Services within 31 days. We generally delete closed account information within 31 days of account closure, except as noted below. We retain your personal data even after you have closed your account if reasonably necessary to comply with our legal obligations (including law enforcement requests), meet regulatory requirements, resolve disputes, maintain security, prevent fraud and abuse, enforce our User Agreement, or fulfill your request to “unsubscribe” from further messages from us. We will retain de-personalised information after your account has been closed. We process data both inside and outside of the UK and Ireland and rely on legally-provided mechanisms to lawfully transfer data across borders. Countries where we process data may have laws which are different, and potentially not as protective, as the laws of your own country. We have lawful bases to collect, use and share data about you. You have choices about our use of your data.At any time, you can withdraw consent you have provided by going to settings. We will only collect and process personal data about you where we have lawful bases. Lawful bases include consent (where you have given consent), contract (where processing is necessary for the performance of a contract with you (e.g. to deliver the Services you have requested)) and “legitimate interests”. Where we rely on your consent to process personal data, you have the right to withdraw or decline your consent at any time and where we rely on legitimate interests, you have the right to object. If you have any questions about the lawful bases upon which we collect and use your personal data, please contact our Data Protection Officer using our contact us form. If you have questions or complaints regarding this Policy, please first contact us online. You can also reach us by physical mail. Data protection is of the highest priority to us. The use of our website is possible without any indication of personal data; however, if a data subject wants to use special enterprise services via our website, processing of personal data could become necessary. If the processing of personal data is necessary and there is no statutory basis for such processing, we generally obtain consent from the data subject. If one of the aforementioned reasons applies, and a data subject wishes to request the erasure of personal data stored by us, he or she may, at any time, contact any employee of the controller. An employee shall promptly ensure that the erasure request is complied with. We inform our customers and business partners regularly by means of a newsletter about enterprise offers. The enterprise’s newsletter may only be received by the data subject if (1) the data subject has a valid email address and (2) the data subject registers for the newsletter shipping. A confirmation email will be sent to the email address registered by a data subject for the first time for newsletter shipping, for legal reasons, in the double opt-in procedure. This confirmation email is used to prove whether the owner of the email address as the data subject is authorised to receive the newsletter. Such personal data collected in the tracking pixels contained in the newsletters are stored and analysed by the controller in order to optimize the shipping of the newsletter, as well as to adapt the content of future newsletters even better to the interests of the data subject. This personal data will not be passed on to third parties. Data subjects are at any time entitled to revoke their declaration of consent to receive newsletters.